NiniteOne.exe must be in your 3rd Party Tools directory, but it really can be ANYWHERE in there. Better yet, it should be on your FTP server if you are using one. To get it there, goto d7II Config > Custom Apps > Integrated Apps and select to upload your zipped NiniteOne.exe file. 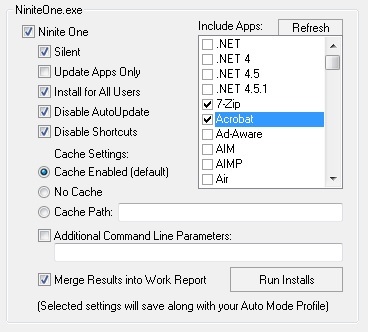 Once NiniteOne.exe is located in your 3rd Party Tools dir or on your FTP server, you need to click the Refresh button to populate the list of applications that NiniteOne supports. This should only need to be done once, or every time NiniteOne is updated with new applications. After the refresh, you may prune what apps appear in the listbox by manually removing unwanted apps from the NiniteInstallApps.txt file in your d7IIConfig directory. Save your Auto Mode Profile to save the NiniteOne settings including the list of apps to install. so its progress is visible. .
EDIT: actually there is a Ninite is installing message in d7II I’m not sure how you are missing that..
as for a ninite progress ‘dialog’ there isn’t one. I’m not hiding anything, it’s just that … there isn’t one! It would appear they don’t have a “passive” switch, only a “silent” one. If you don’t use the silent switch you don’t get automation OR the report when finished… these are some issues I’ll definitely bring up to the Ninite folks when I get the opportunity. Ninite is installing message does not appear on mine . You can put NiniteOne.exe and ANY Ninite related files inside the 3rd Party Tools directory anywhere, and it will be used. I’m still learning Ninite and haven’t even used it fully yet in all situations, but I think the default setting will store the cache right there with NiniteOne in the same folder structure. Then there is the cache path switch which you can use to specify like say a UNC path to your NiniteDownloads dir for bench work. I’m not positive but I believe if you didn’t want the NiniteDownloads to be in 3rd Party Tools (just NiniteOne.exe) and you maybe had a NiniteDownloads folder in the root of your flash drive and not a UNC, then I’m sure you could put in the cache dir “NiniteDownloads” and it would find/use the cache located there. If a relative path will not work and it needs a drive letter specification, just LET ME KNOW and I can add a %variable% for that..
No matter what network path I put in for NiniteOne cache path, it says the path can’t be found. I do have D7II launched with system privileges. Any log that I could use to figure out why this isn’t working? it is in fact because you are running it under the local system account, which the limitation is that account doesn’t have permission to access network resources. even if d7II detected the network path successfully, Ninite which would subsequently launch under the local system account and would also not be able to detect the cachepath.